Fed up with the grey weather and fancy some sun, sea and pumping tunes this summer on the white isle? Then get yourself involved with our special Ibiza trip at the end of June 2011. 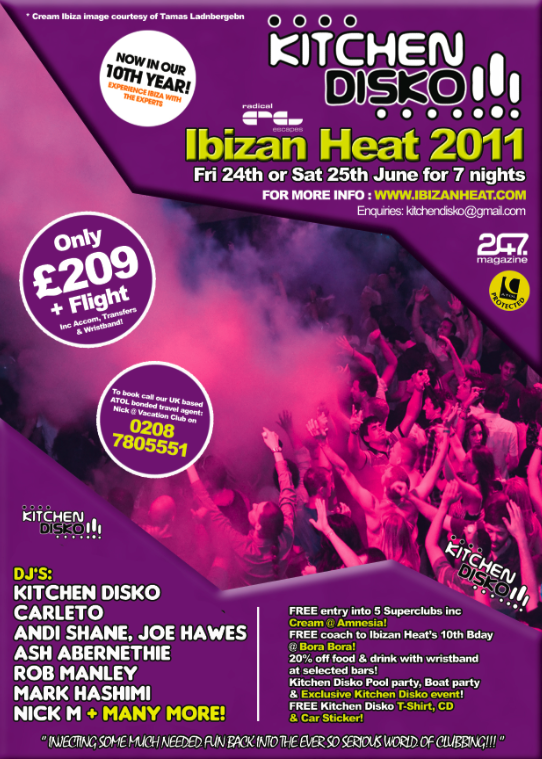 We have teamed up with Exeter promoters, Hindsight, Kitchen Disko and Ibizan Heat 2011 for seven days and nights of parties with a great package that includes accommodation, discounted food and drink wristband for selected bars/restaurants, pool parties, entry into five massive parties including Cream at Amnesia and Ibizan Heat’s Bora Bora 10th birthday party. This package is only £209 (ex flights) and you need to book your flight to arrive in Ibiza on Fri 24 or Sat 25 June. More info at www.ibizanheat.com and call Nick at Vacation Club 0208 780 5551 to book now. All holidays are protected by ATOL and you only need to pay a small deposit now to secure your place. How Do Men & Women Differ In Sport?